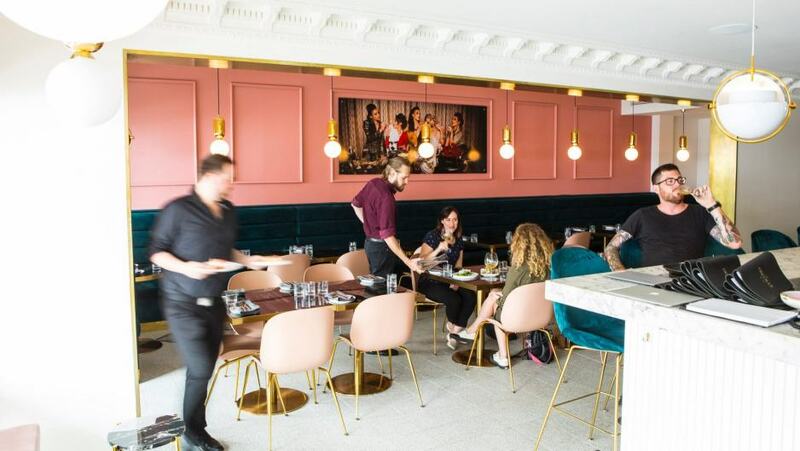 There’s so much gleam and glam going on at the Greville that I expected the food to be something of an afterthought, little more than a sponge to soak up the savvy blanc, if you know what I mean. But the first dish to come out of chef Casey Norman’s kitchen proved how wrong I was. Three golden-toasty brioche fingers are daubed with bonito whip, an aerated seafood dip made from smoked, dried tuna. 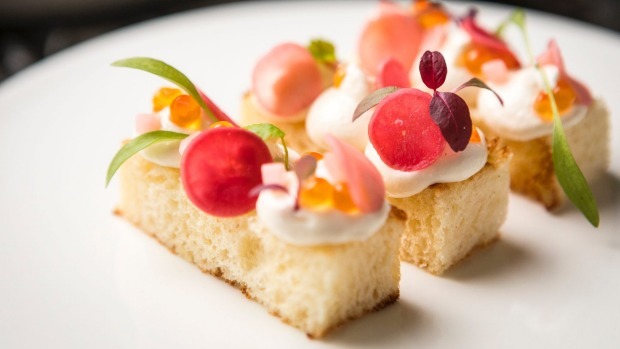 They’re dressed up with salmon caviar, pickled radish and microherbs. It’s a startlingly pretty starter and pays off in pert and balanced flavours. Norman has most recently been heading up Hotel Brighton, which has the same owners. Prior to that she ran a Middle Eastern food truck, cooked at a farm-to-table restaurant in Canada and worked for two years at Cumulus Inc. She’s parlayed her varied experience into a fresh, approachable easy-share menu, and the good dishes keep rolling. 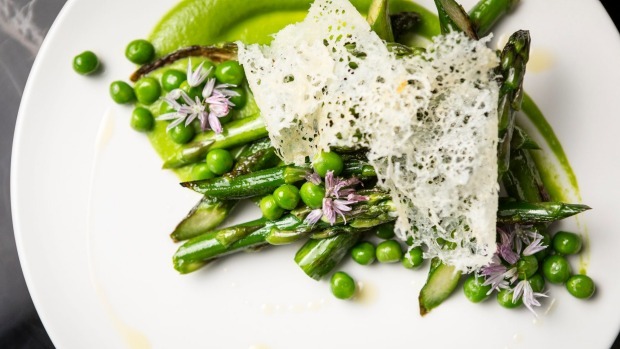 Local asparagus is fiercely sauteed in burnt butter and piled up like Jenga blocks over pea puree. A lacy parmesan crisp and dainty mauve chive flowers balance on top. Flavouring oysters rarely improves them but a beetroot and pepper dressing is a sharp and beguiling foil for creamy shellfish. King prawns are grilled, slapped over a tart remoulade and rustic quinoa crackers – they’re fancy barbecue bites. Eggplant is tempura-fried and topped as though it was okonomiyaki (Japanese pancake) with tangy barbecue sauce, sweet mayo and bonito flakes waving lazily back and forth. It’s a clever dish, lightening up a classic while retaining the richness. The only misstep was a butterflied and grilled chicken: nothing terrible but nothing special either. It’s so often the case that larger meat dishes are boring compared to artfully composed entrees – here’s a case in point. 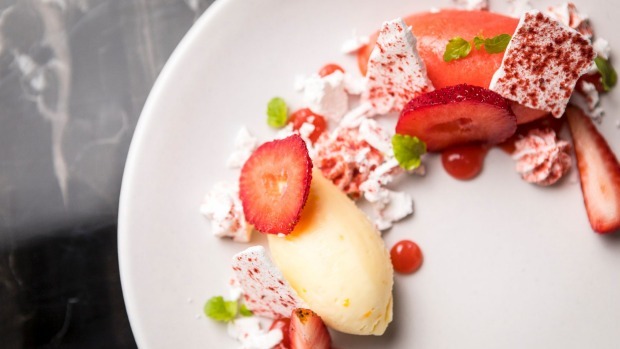 A strawberry dessert made amends, with five textures of strawberry (fresh, frozen, jellied, dried and powdered) arranged with painterly poise. The Greville puts an interesting twist on dietary preferences: instead of marking which items are gluten-free, the menu asterisks the few dishes which can’t be free from the protein. It’s a canny skew, critical for those with allergies, but also pitched to sparkling “clean-eaters” who might be happy to crack pink Moet or sip excellent cocktails (I loved the Rhubarb Paper Plane with bourbon, Aperol and amaretto) but consider bread a sinful poison. This spot on Greville Street has had many incarnations. It was built as Leggett’s ballroom and was one of the city’s main social hubs from the 1920s to the mid-1970s. The site has also housed squash courts, the tremendous Continental music venue through the 1990s, and cafes and restaurants both awesome and underwhelming. The current incarnation cheekily appropriates the history by slapping “established 1926” on its collateral, along with a tagline of “Drink. Dine. Dance”. As well as the Greville’s pink, green and gold dining room, there’s a champagne bar at the left and nightclub and function rooms upstairs. In a way, they might as well assume the legacy because the Greville is continuing it, offering a Prahran playground for grown-ups. In the 1920s it was swing. In 2019, it’s pink champagne and bonito brioche. The best thing about it is that there’s substance behind the shine. First published in Good Food, 2nd January 2019.